All the paddles we sell are custom made to help you make your own unique adventure. For this reason delivery times can be several weeks. Contact us for details of your individual requirements. Named after the Norse household warriors, this paddle is designed for every day general purpose paddling. It is a beautiful all round paddle to use with the full range of strokes. The blade size is generous giving it the potential for bursts of power when needed. The shape is based on a modified beavertail. Named after the Norse Lordlings, the Thane is a beautiful paddle for touring. Like the Viking its shape is perfect for deep water paddling where the blade length provides excellent grip in the water and allows for a long slow blade rhythm to develop. With a slightly larger blade surface area than the Viking, the Thane has the potential for more power to be generated with each stroke. This paddle is based on a long bladed Voyageur. VE C1 Whitewater paddles are custom made on request. 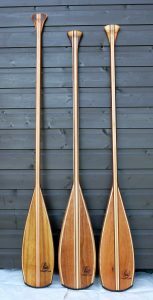 They can be made to any length, in one, two or even three pieces if the paddle's long enough. Blade and shaft are available in glass or carbon for your choice of weight and flexibility. These are some of the best designed top quality powerful white water paddles available anywhere and we're proud to be able to list them on our website. We're an active and interactive business. Follow us, contact us, like us, tag us, message us... Join us!